Every month we spend an evening scouring the pages of the latest issue of Previews and pick the ten titles we are looking forward to the most. This month it's the May issue which includes comics scheduled to ship in July 2015. 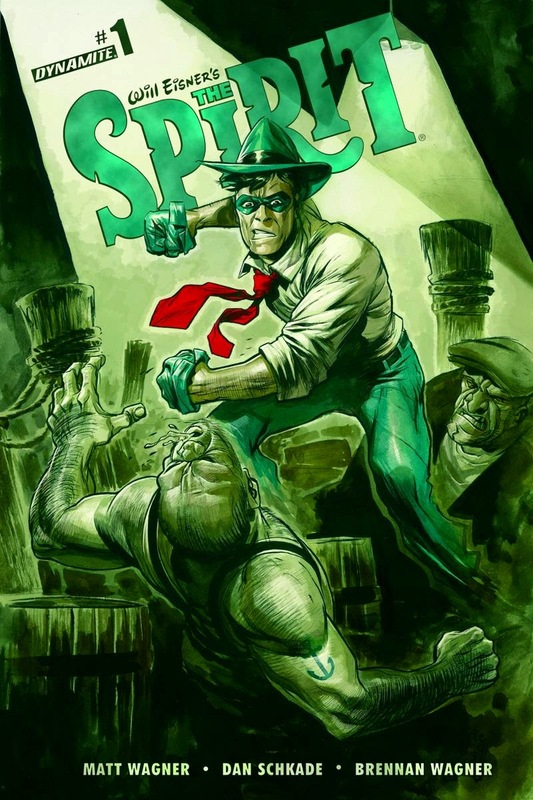 Rob N: Taking responsibility for a new Spirit comic is a risky proposition for any but the most seasoned and respected of comic book authors, for not only are you assuming the mantle of the late great Will Eisner but, to make matters worse, your creation is also going to be judged alongside the later run by the not so late, but arguably almost as great, Darwyn Cooke. So not only do you now have to do the original classic stories justice but you have to try not to look stupid compared with a top of the class pastiche already in print. Personally speaking, that's the kind of albatross around your neck that I wouldn't consider for a moment if I were a comic book writer, but Matt Wagner it seems is made of bolder stuff than me for he has indeed thrown his hat in the ring and even now grapples with the task in hand. Wagner is one of maybe a dozen names who has the potential to succeed, but even so it's a steep hill that he has to climb if later reviews don't immediately compare his work unfavourably with Cooke's. The sample pages in Previews though do seem promising so let us give him the benefit of the doubt and at least applaud his ambition. Stewart R: Valiant have really won me round to their four issue miniseries following the superb The Valiant and the yet to be concluded Divinity. 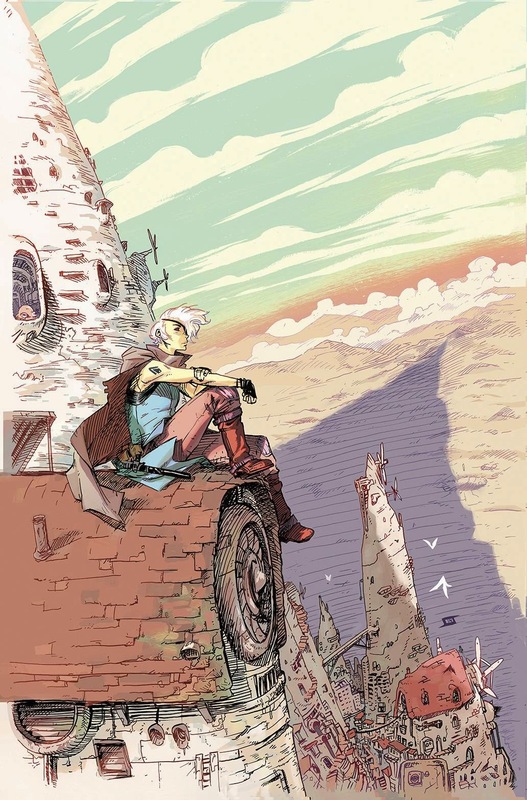 Following on from Jeff Lemire and Matt Kindt's work in The Valiant, Robert Vendetti is going to take us on a journey through the pages of the Book of Death, the mysterious tome that arrived through time with the young Geomancer from the far flung future. Within its pages is recorded the events that lie ahead through this universe's future and the Eternal Warrior must protect the young girl and her book from falling into the hands of heroes and villains alike, all desperate to learn of their fates and ends. The first chapter promises to be something of a chase story as EW and the girl go on the run, while the next three instalments will look at the predestined last stands of some of the Valiant Universe's greatest heroes. Yes, there is most certainly a 'What If' vibe to this idea, but by golly, this publisher seems to be doing things right these days so I'll be picking this up. James R: Sadly, this isn't a new series about the worryingly-coiffured 'villain' from the UK version of TV's Gladiators, but it still jumped out from the pages of Previews as the essential title this month. 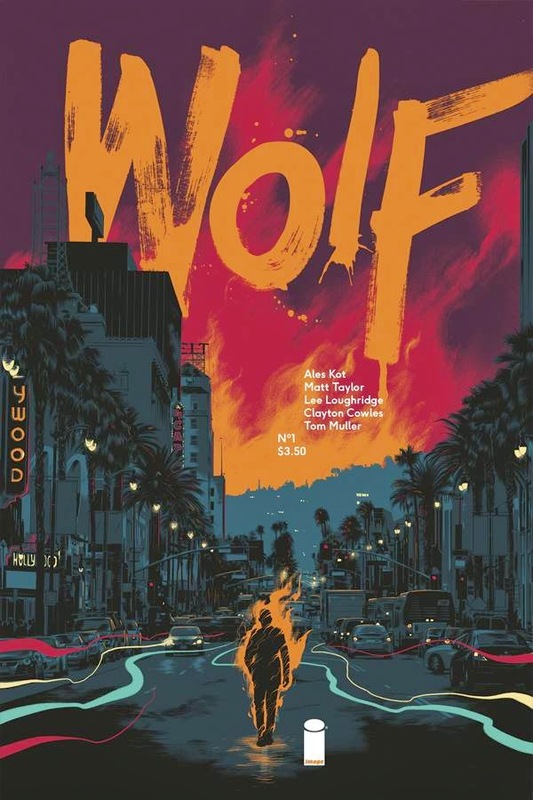 Wolf is the new series from Ales Kot, whose work on Zero at Image Comics has never been less than inspired. Wolf looks as if it is going to be a mix of one of my favourite things - noir fiction - with elements of fantasy and horror. Set in an 'unseen' Los Angeles, the comic follows the cases of private detective Antoine Wolfe. Kot claims that the series is one big story, but in in an interview with CBR, he highlighted some of the upcoming obstacles for Wolfe, and they are: "Racism, prison-industrial complex, unresolved past, vicious mystical creatures, vicious human creatures, the possible end of California, demons, hell." With art from Matt Taylor and Lee Loughridge, this book looks incredibly exciting, and a welcome new addition to my pull-list. Stewart R: I'm not usually one for picking up graphic novels, the weight of my weekly comic order proving more than enough to keep me reading until the next Wednesday rolls around. Every once in a while however I do get won over by a good premise and the terrific promise of top grade art. This month's Previews threw The Divine in my path and though the story doesn't appear to be anything particularly new on the surface - former military man with a stable, boring civilian life and new found commitments is approached by an old army buddy to come work with him on a potentially dangerous project in a mysterious foreign country...fantasy hi-jinks ensue - the artwork from Asaf Hanuka & Tomer Hanuka is certainly an attractive element that has me contemplating splashing out on a bigger read than I usually get in my pull-list. Plus, you know, there's a dragon! Rob N: European comics! From the 1980s! That look like they’re from the 1970s! With cute girls with swords! (Possibly). You can almost hear this book calling out to me with its beguiling and coy glance in my direction. The little French Graphic Novel tease! I have to confess that despite its (so I'm told) classic status in the land of the croissant eaters, I'm as ignorant as you are about this one. I also have to confess that the initial blurb made me look away to begin with: ‘The world of Akbar is in grave danger; Ramor, the cursed god, is about to be set free and spread unending chaos! 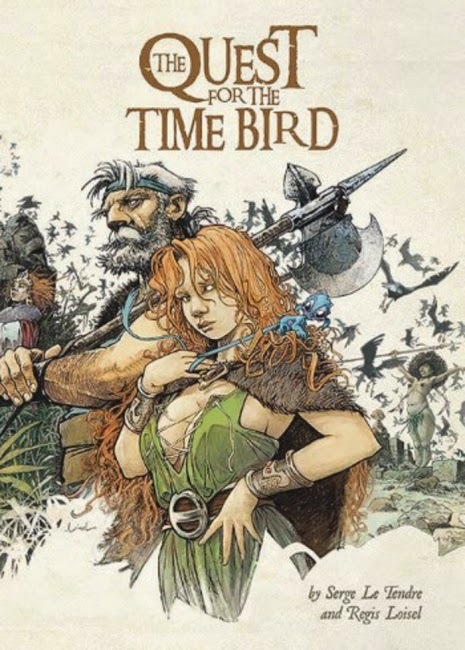 The witch Mara can bind him to his prison, a conch shell, but she needs something special to do so… the legendary Time Bird. She charges her daughter, Roxanna, with enlisting the help of the ageing warrior Bragon, and together they set out on a quest to save the world!' Snore... It frankly makes me think of all those bloody awful 'High Fantasy' Dungeons & Dragons style novels that crowd the bookshelves of Waterstones. But, liking the art samples I saw, I decided to Google it and found the underlying premise more appealing than the commercial blurb might suggest for this is essentially a melancholic tale of ageing, once renowned heroes, dealing with their fading glory on one last escapade before they drink themselves to oblivion in a waterfront tavern to make way for younger and punkier replacements. I've always had a liking for Unforgiven or Carlito's Way style stories of the legendary reputation-heavy old timers doing 'one last job' and if that's the theme of this graphic novel then I'm tempted to overlook all that 'The world of Akbar is in grave danger' nonsense. And if the Internet is to be believed, parts of it were originally serialised in Charlie Hebdo magazine, so on that basis I'm almost obliged to support it I guess. Matt C: I think I somehow made it through most of 2015 without picking up any original graphic novels (beyond various Euro-reprints). And if I did, I can’t remember what they were! This one caught my gaze though, as it appears to be going down the rights of passage route, encompassing themes of loss and family, which suggests it may be aiming for the heartstrings. Oh, and it also seems to be mixing in Norse myth for good measure! I know nothing of the creators but I know the Archaia imprint is very reliable when it comes to quality graphic novels, so I’m happy to take a gamble of this tome. 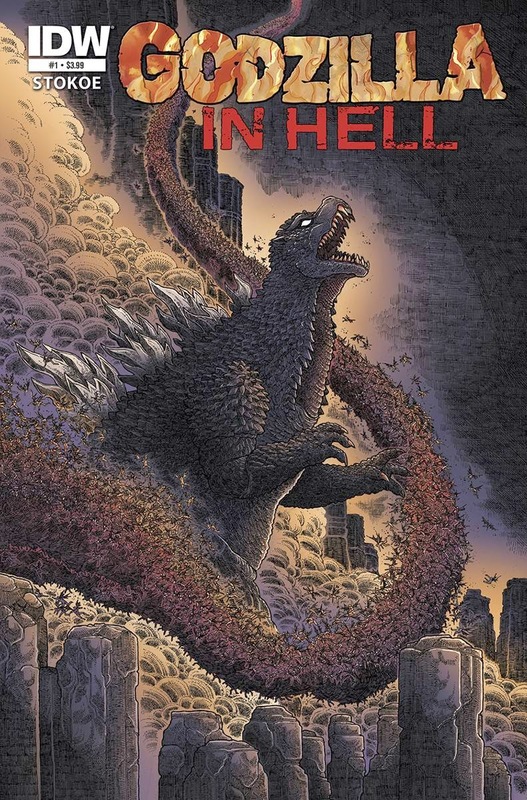 Stewart R: I'll state off the bat that I'm not convinced about this as a series, but considering IDW has James Stokoe of Godzilla: Half Century War fame penning both script and illustration for the opener, I have - HAVE! - to invest in at least one issue to see what is what. It appears that, rather strangely, this is going to be a supernatural mystery story, where everyone's favourite kaiju has been teleported to the domain of Hell, comes under attack by the creatures that lie within and has to solve the mystery of both how he came to be there and how to return to Earth. The interesting thing will be to see how Godzilla interacts in this particular journey, that and of course just what sort of crazy beings and creatures Stokoe conjures to the page! Rob N: Zenith for me was one of the superhero highlights of the 1980s and I can only assume that the reason the collected work isn't as lauded as its more famous rivals (Watchmen, Marvelman, Dark Knight Returns, Killing Joke et al) is mostly because of its patchy reprint history. Seemingly lost down the same black hole of litigation as Marvelman, Zenith has languished for far too long away from the printed page. Personally speaking, I felt that the third book was the creative high point with its gloriously anarchic and shambolic war against the Lloigor that consisted mostly of once bold superheroes running away, screaming “Help! We're losing!” but the fourth book rounded the saga off in decent style, though the jury is still out as to whether the switch to full colour made it any better than the previously bleak black and white volumes. Of course, in an ideal world, the entire saga would be available in a single 'Absolute' size edition, but I guess you have to take what you can get. Often when I look back at classic works I have to mention that much of what was boldly original at the time now feels overly familiar due to dozens of derivative works written under the influence, but you know what, in the case of Zenith the ideas are still fresh and I don't think anyone since has ever captured the sneering feel of these works quite so well. Still iconic after all these years. Stewart R: When you read a miniseries from a newly formed collaborative team, get to the finale and start to anticipate what that partnership may produce in the future, you know you're onto a good thing. The bringing together of writer Simon Spurrier and artist Jeff Stokely for Six-Gun Gorilla from BOOM! was one of those moments as they carefully crafted a superb science fiction romp that excited and entertained. Well, now they're back with The Spire, a “weird-fi crime mystery with apocalyptic fantasy” as Spurrier has put it himself, where the protagonist, Shå, is possibly the last human alive in a mixed-species society and is the one charged with investigating the aforementioned murder. Expect things to spiral out from there in glorious fashion as Spurrier hits his expansive stride and I'm optimistic this could be as engrossing as this team's last project. Kenny J: Over Rick Remender’s short (so far), yet quality run on Captain America we’ve had an eighty year-old Steve Rogers, Sam ‘The Falcon’ Wilson and interdimensional mutants donning the famous stars and stripes. However, it was the unlikely monikered Ian Rogers, Steve’s adopted son that takes up the cause and the shield in this Secret Wars tie-in. This particular Battleworld imagines that the titular Hydra took control of the United States of America hundreds of years ago, along with some ‘Hydra-ised’ familiar faces. Joined by his Winter Soldier: The Bitter March collaborator, Roland Boschi, we are sure to get a beautifully rendered and dynamic espionage story.